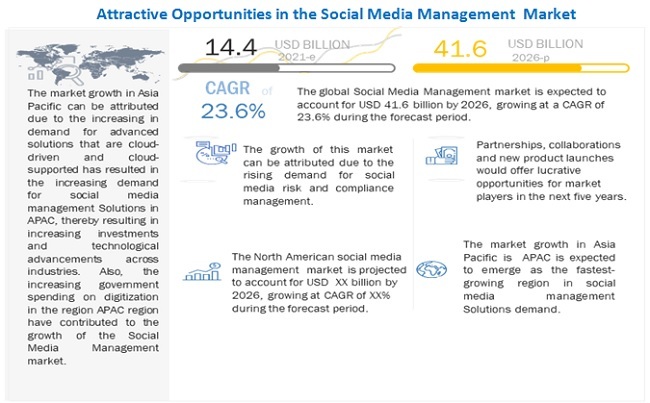 [168 Pages Report] The global social media management market size is expected to grow from USD 9.2 billion in 2018 to USD 17.7 billion by 2023, at a Compound Annual Growth Rate (CAGR) of 14.1% during the forecast period. The demand for cloud social media management solutions is expected to grow over the next 5 years, owing to several factors including massive adoption of social media and huge volumes of data generated across major industries, including BFSI, retail and ecommerce, government and public sector, and manufacturing. A need to realize an increasing RoI on social media strategy, a growing focus on the market and competitive intelligence, and an increasing need for social media measurement to enhance the customer experience are key growth factors for the market. The social media marketing solution segment is expected to constitute the largest market size during the forecast period with the wide-spread adoption of the solution across organizations in many industry verticals. It proves to be a vital tool for marketers to easily and quickly reach their targeted audience and engage them effectively. Social media engagement and social media advocacy are 2 major components of social media marketing. The social media engagement involves management of the existing and potential customer interactions on various social media networks of a company. Social media advocacy and selling deals with brand development through third-party engagements (employee or existing customers). An increasing need to have market intelligence to gain a competitive edge is expected to drive the competitive intelligence application in the social media management market. It incorporates all activities that a company undertakes to gain insights into what their competitors are doing, track competitors’ activities, and any conversation that may be happening between a company and its competitors’ customers on social media platforms. Social media platforms can provide a wide variety of information about customers, their experiences, needs, and perceptions. The increasing use of social media has transformed banking relationships with customers in significant ways, from improving customer service to enabling users to send money to others via online platforms. BFSI organizations have started monitoring customer conversations for brand mentions and customer complaints, and started responding accordingly, using the measuring, monitoring, and analyzing functionalities present in the social media management solutions. The growth of fintech continues to have a significant impact on the BFSI industry vertical. Established financial institutions are collaborating with key innovators in response to customer demands for effective social media management platforms. 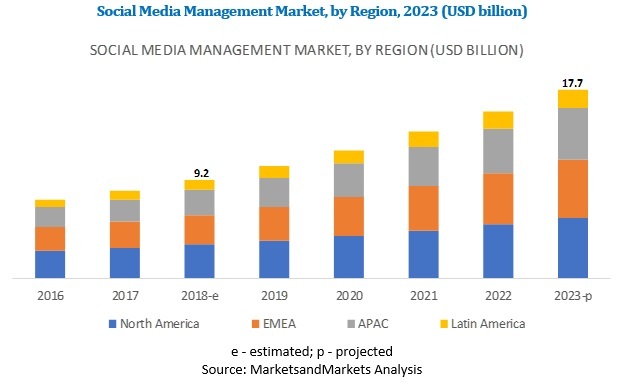 The global social media management market by region covers 4 major regions: North America, Asia Pacific (APAC), Europe, Middle East and Africa (EMEA), and Latin America. North America constitutes the highest market share, owing to the early adoption of advanced technology solutions as well as prominent initiatives taken by industry players through partnerships with various technology players. The US and Canada are witnessing increased adoption of advanced technologies, including social media monitoring and analytics. The social media management market comprises major vendors, such as IBM (US), Oracle (US), Salesforce (US), Adobe (US), Hootsuite (Canada), Sprout Social (US), Google (US), Sysomos (Canada), Sprinklr (US), Digimind (France), Clarabridge (US), Spreadfast (US), Falcon.io (Denmark), Zoho (India), and Lithium Technologies (US). The study includes in-depth competitive analysis of these key players in the global market with their company profiles, recent developments, and key market strategies. In October 2018, Adobe acquired Marketo, a B2B marketing engagement company. The combination of Adobe Experience Cloud and Marketo’s Engagement platform provides an unrivaled set of solutions for delivering transformative customer experiences across industries and companies of all sizes. In October 2018, Digimind introduced Digimind AI Sense, a new series of AI-powered features within the Digimind Social platform. Digimind AI Sense uses the mixed approach of machine learning, Natural Language Processing (NLP), and image recognition capabilities. In September 2018, IBM partnered with IRIS.TV to launch a new solution, Video Recommendations. It is a content personalization engine powered with AI capabilities, which increases viewer engagement through video programming recommendations. In June 2017, Sprout Social and Twitter launched Bot Builder, a social media marketing tool. The tool would help resolve consumer issues and offer unique marketing experiences to customers. What are the opportunities in the social media management market? How are mergers and acquisitions evolving the market? The study involved 4 major activities to estimate the current market size for the global Social Media Management market. An exhaustive secondary research was done to collect information on the market, the peer market, and the parent market. The next step was to validate these findings, assumptions, and sizing with the industry experts across the value chain through primary research. Both top-down and bottom-up approaches were employed to estimate the complete market size. Thereafter, the market breakdown and data triangulation procedures were used to estimate the market size of the segments and subsegments. In the secondary research process, various secondary sources, such as D&B Hoovers and Bloomberg BusinessWeek, have been referred to for identifying and collecting information for this study. Secondary sources included annual reports; press releases and investor presentations of companies; whitepapers, certified publications and articles by recognized authors; gold standard and silver standard websites; Research and Development (R&D) organizations; regulatory bodies; and databases. Various primary sources from both supply and demand sides of the Social Media Management market ecosystem were interviewed to obtain qualitative and quantitative information for this study. The primary sources from the supply side included industry experts, such as Chief Executive Officers (CEOs), Vice Presidents (VPs), marketing directors, technology and innovation directors, and related key executives from various vendors providing the social media management software, associated service providers, and system integrators operating in the targeted regions. All possible parameters that affect the market covered in this research study have been accounted for, viewed in extensive detail, verified through primary research, and analyzed to get the final quantitative and qualitative data. This research report categorizes the market based on component, application, deployment model, organization size, industry verticals, and regions.